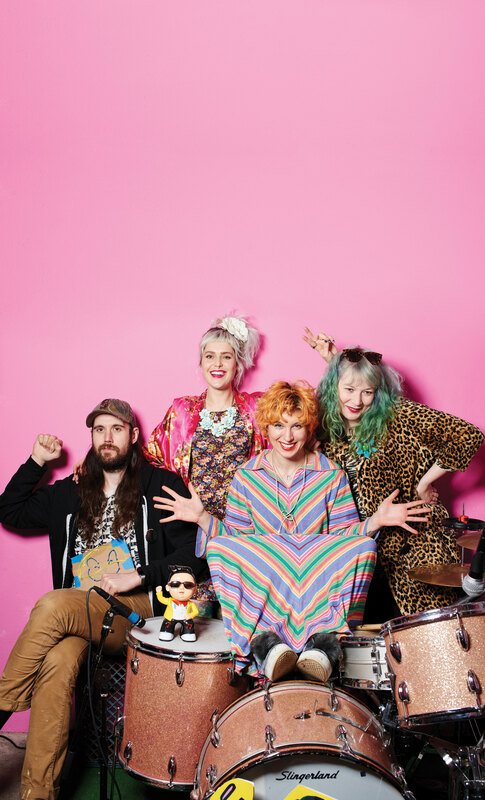 Emily Nokes, singer for Seattle’s premiere feminist pop punk party band, chats about the group’s favorite local music, cheap eats, and artistic spots. What makes Seattle a good city for artistic folks? People support each other a lot. It’s not very competitive, unlike other places I’ve seen. It feels like people like to lift each other up: featuring other bands on your album, getting musicians to play album release shows together, having local artists do your album art. People are down to collaborate. Who are your current favorites in the local music scene? Right now I’m super into DoNormaal—she’s so talented. I also really like Childbirth and Lisa Prank. I can’t wait for the new Shabazz Palaces album. I’m really proud and excited about all the music that’s been happening here in the last five years or so. How does living in Seattle inspire your creativity? It’s mostly the people that are here. I really love the arts scene; I feed off it. Seattle just has something really smart and special about it that you can’t really replicate. Does Tacocat have any favorite spots for a casual bite? We really like Seven Stars Pepper (1207 S Jackson St; sevenstarspepper.com) because they have large round tables and big Lazy Susans that you can put all their glorious food on. And Hot Mama’s Pizza (700 Pine St; hot-mamaspizza.com). It’s the first pizza I ever had when I was a poor college student in Seattle, and the green pizza is my favorite. I hope they never ever, ever close. What are the best artistic landmarks to visit in Seattle? The Kurt Cobain Bench (151 Lake Washington Blvd E) is a pretty spot, and the messages carved into it are sad and hilarious and just capture all the grunge feelings that Seattle has for itself.